Jim Greenway dominated the Pro Stock class all season, and it was no different at the World Finals. 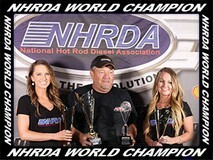 His Baillie Diesel Dodge, named "Gertrude" won both the World Championship and the 2016 Points Championship in Pro Stock. His pull of 335.10 feet was one of the best of the entire evening.